Living with Intent is a chronicle of Mallika Chopra’s search to find more meaning, joy, and balance in life. She hopes that by telling her story, she can inspire others with her own successes (and failures) as well as share some of the wisdom she has gathered from friends, experts, and family along the way—people like her dad, Deepak, as well as Eckhart Tolle, Marianne Williamson, Arianna Huffington, Andrew Weil, and Dan Siegel. She also provides a practical road map for how we can all move from thought to action to outcome. Each chapter is devoted to one step on her journey and another piece of her INTENT action plan: Incubate, Notice, Trust, Express, Nurture, and Take Action. Chopra’s insights and advice will help us all come closer to fully living the lives we truly intend. "Clearly, Deepak is not the only lifestyle sage in the Chopra family. 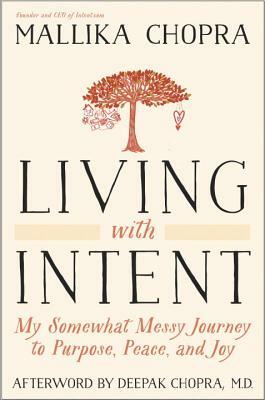 Mallika is warm, wise, and witty and LIVING WITH INTENT is a wonderful and helpful read." "Whether we know it or not, we matter; today matters. Mallika Chopra shows us all how to live quiet lives of inspiration. Her book and journey are not to be missed." "When's the last time you slowed down, reflected deeply, and were satisfied with what you saw? In this warm, inspiring, and practical memoir, Mallika Chopra reconnects with her passions and daily purpose. For anyone interested in a journey of self-reflection and joyful discovery, Chopra makes a delightful companion and guide."